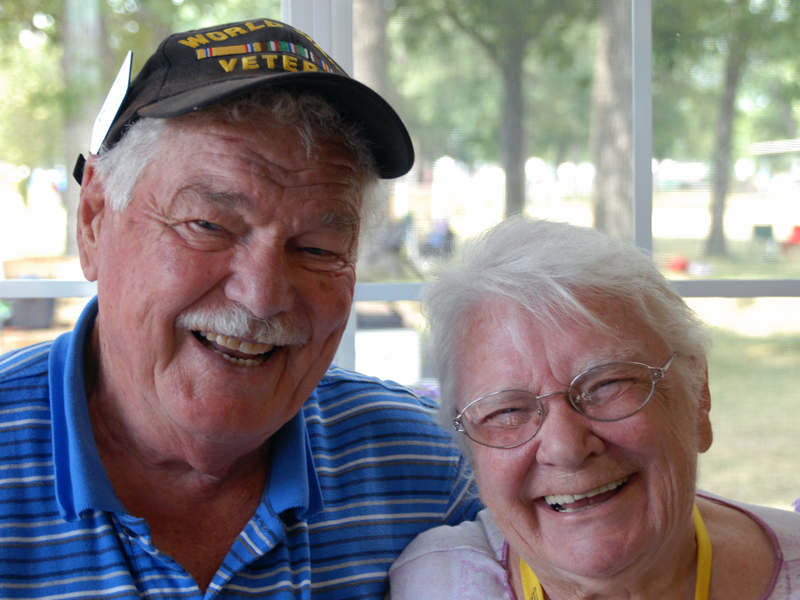 Each year at AirVenture more than 500 individuals volunteer with Vintage. Our Flight Line volunteers in their bright orange vests are obvious as they manage over a mile of visitors sitting between rows and rows of airplanes. The size of the flight line is such that the ground crew must use scooters rather than park planes on foot. Over one-third of our AirVenture volunteers work on the flight line. But the heart of our Vintage family is often unseen and unsung. Vintage Volunteers photograph every Antique, Classic, and Contemporary showplane. Vintage Volunteers assemble and distribute plaques for every showplane pilot. Vintage Volunteers unpack, display, and cheerfully help customers in The Red Barn Store. Vintage Volunteers carefully charging your cellphones and laptops while you view the airshow. Vintage Volunteers create and produce individual collector name badges for all our volunteers. 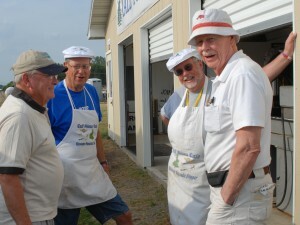 Vintage Volunteers cook and feed other volunteers in our special Vintage lunchroom. Multiple teams of Vintage volunteer judges evaluate each vintage aircraft whose pilot wants to improve his or her plane. Vintage Volunteers from individual Type Clubs meet daily with individuals and groups who love their particular aircraft. Vintage Volunteers cook hundreds of breakfasts each day at Tall Pines Cafe and then clean the place to be ready for the following day. Vintage Volunteers welcome other volunteers, sign them up for jobs, and record the hours they serve. Vintage Volunteers serve as officers and members of our Board of Directors, giving untold year-round hours to keep Vintage functioning. Vintage Volunteers manage the Aeromart for all visitors at AirVenture. Vintage Volunteers operate a daily workshop for visitors to see how our planes are restored. Vintage Volunteers popping popcorn for visitors to The Red Barn. Vintage Volunteers share their smiles to arriving pilots with a much-appreciated bottle of water. 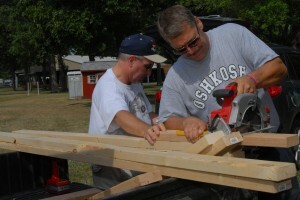 Vintage Volunteers providing maintenance and construction service for the Vintage area. And while the rest of us sleep, Vintage Volunteers continue 24 hours per day providing security to the entire Vintage area. THIS is the heart of Vintage.